“There’s a big announcement coming on Wednesday,” Paula Fuga whispered. “And it will sell out like that,” she said with a quick snap of her fingers. “It involves these guys,” she said motioning to her Mana Maoli band-mates. Big announcement? Quick sell-out? Hmmm, could it be Jack Johnson? It had to be. He has long been a huge supporter of Hawaii’s musicians including the collective’s Paula Fuga and John Cruz, who have both appeared at his Kokua Festival benefit concerts. So when the announcement came today that Johnson will be island hopping in April for a seven-date acoustic tour with Fuga and Cruz, I wasn’t surprised – but I was thrilled. 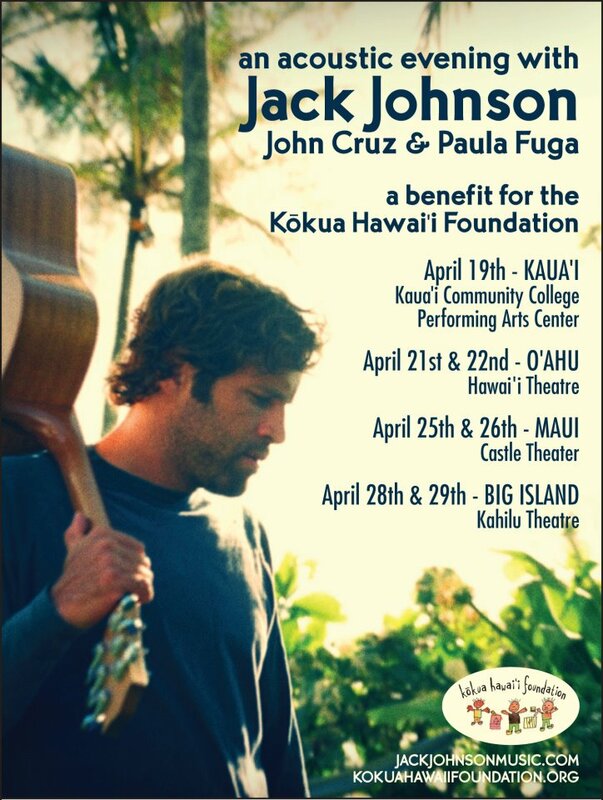 The tour follows the April 17 release of Jack Johnson and Friends – Best of Kokua Festival. The upcoming benefit album features 13 tracks of live performances culled from six years of Johnson’s eco-minded music festivals. In addition to Fuga and Cruz, the album features Willie Nelson, Ben Harper, Eddie Vedder, Jackson Browne, Dave Matthews, Tim Reynolds, Kawika Kahiapo, Zach Gill, Jake Shimabukuro, Ziggy Marley, Taj Mahal, Damian “Jr. Gong” Marley, Ozomatli and G. Love. The tour kicks off April 19th at the Kauai Community College Performing Arts Center, followed by April 21-22 at the Hawaii Theatre on Oahu; April 25-26 at the Castle Theatre on Maui; and April 28-29 at Kahilu Theatre on the Big Island. Tickets for all shows will be available beginning March 3 at each venue box-office. There will be a strict two-ticket per person policy in place for all seven shows. Proceeds from the album and the tour will benefit the Kokua Hawaii Foundation. For more details on the foundation, album and tour, visit the official Kokua Festival website.